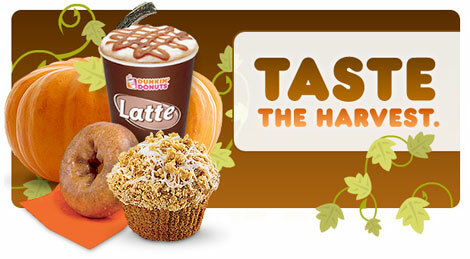 Stop by your neighborhood Dunkin’ Donuts to check out their new Fall selection of beverages. At some local shops you will be able to taste a 4 oz. sample of one of their delicious fall beverages between 10 AM and 2 PM on Friday, September 24th and Saturday, September 25th. The samples can include the new Apple Cider, served Hot or Iced, or enjoy a taste of one of our delicious Pumpkin Coffees or Lattes. I will be going to my local shop around 10 AM or 11AM, but I don’t know what delicious fall selection I will try! Only at participating locations in New England! UPDATE: When I arrived at my local store before going to a local chili and chowder fest I ordered my usual large iced hazelnut and inquired about the samples. At 11AM which is when I ordered they were already out of samples. It was a bit of a bummer but oh well!